The October 2016 State of Oregon Economic Indexes of was released today. Full report is available here. We thank KeyBank for their generous support of this project. The Oregon measure of economic activity rose to 1.08 from an upwardly revised September figure of 0.25. The three-month moving average, which smooths month-to-month volatility in the measure, was 0.78 (“zero” indicates average growth over the 1990-present period). All sectors contributed positively to the measure in October. A strong read on average weekly hours worked boosted the beleaguered manufacturing sector contribution. The construction sector felt the positive impact of stronger employment; housing permits made a slightly negative contribution. Positive or neutral contributions from nearly all components buoyed the household sector; historically low initial unemployment claims were particularly supportive. 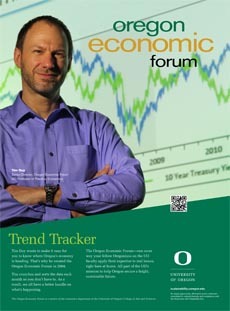 The University of Oregon Index of Economic Indicators extended September’s gain, rising 0.2 percent in October. The softness in employment services payrolls (largely temporary help workers) looks to be over; the sector added jobs again this month. The Oregon Weight Distance tax, a measure of trucking activity, jumped again, indicating a pick up in economic activity. Core manufacturing orders edged higher as capital investment activity continues the period of softness that followed the collapse of oil drilling activity last year. Consumer sentiment is generally tracking sideways at levels consistent with continued economic growth. The interest rate spread widened as investor confidence in the economy rose. Together, these indicators suggest ongoing growth in Oregon at an above average pace of activity.